This Site and all the Content on it is owned by Milly Days & Milly Giveaway (or its licensors and content providers). All rights in the Content are reserved to their respective owners, unless expressly stated otherwise. You may not use any Content on this Site unless it is expressly stated that you may do so. If you send or post any Contributions to this Site or to Milly Days & Milly Giveaway, you confirm that you are granting Milly Days & Milly Giveaway a perpetual (and irrevocable), royalty-free, worldwide, non-exclusive licence to use the material in your Contribution for any purpose in any media in any part of the world. This includes the right for Milly Days & Milly Giveaway to copy, edit, publish, grant sub-licences, and exercise all other copyright and publicity rights over the material. You also waive all ‘moral rights’ in the materials (‘moral rights’ are described in the Copyright, Designs and Patents Act 1988). If you do not wish to grant us these rights, please do not send or post your Contribution to this Site or to Milly Days & Milly Giveaway. Milly Days & Milly Giveaway does not endorse any Contribution or any opinion, statement, or advice expressed by users of this Site wherever it may appear. To the fullest extent permitted by law, Milly Days & Milly Giveaway expressly disclaims all liability in connection with any Contributions made by users of this Site wherever it may appear. You may only use this Site for lawful purposes and you agree to comply with all applicable laws, regulations and codes of conduct and to be solely responsible for all things arising from your use of this Site. You may not submit, publish, post, distribute or transmit any defamatory, offensive, infringing, obscene, indecent or unlawful or objectionable Contributions. You may not interfere with anyone’s use or enjoyment of this Site, for example by threatening, bullying or sending junk mail. You agree that you are solely responsible for your use of this site, and that to the fullest extent permitted at law, Milly Days & Milly Giveaway, its officers, trustees, employees and agents do not make any representations and do not give any warranties, express or implied, concerning this Site and the Content. In particular, Milly Days & Milly Giveaway does not warrant or represent that this Site or the Content is virus free. 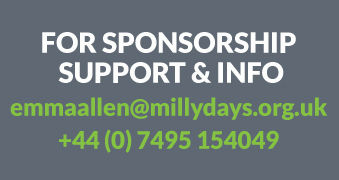 If you wish to donate to Milly Days & Milly Giveaway or sponsor raising money for Milly Days & Milly Giveaway, please note that your donation or sponsorship is non-refundable. If you sponsor someone to do any activity for Milly Days & Milly Giveaway, your sponsorship is not conditional on the activity being completed. This Site may contain links to websites operated by parties other than Milly Days & Milly Giveaway. Such links are provided for your convenience only and you access these links at your own risk. Milly Days & Milly Giveaway is not responsible for the content of any third party websites linked to or from this Site. Milly Giveaway is a charity registered in England, Wales, Registered Charity Number 1162422, Company Reg Number: 9526703, Registered Office : 35 Gloucester Place, London, W1U 8UZ .